SimDash is the software we designed to configure and drive our boards. The SimDash installer will download any additional library if required (Microsoft .NET Framework and C++ Runtime). When SimDash starts, it will check if a newer version is available. If you have Windows Firewall enabled you could get a warning message for this. Supports the latest update of RaceRoom Racing Experience. Added support for Dirt Rally 2.0. Added support for the new version of the fan controller. Added support for Assetto Corsa Competizione. SimDash 22 expands the telemetry data that is available for Forza Motorsport 7. Supports Codemasters' new release F1 2018. SimDash 21 supports Forza Motorsport 7. Only RPM, RPM %, Max RPM and speed data is available at the moment. SimDash 20 supports the new gRally simulator. The JC-LED plugin has been updated. It is now possible to switch a led ON and OFF with a press of a button connected to the JC-LED, Pro-Race, JC32 or JC24 controllers. 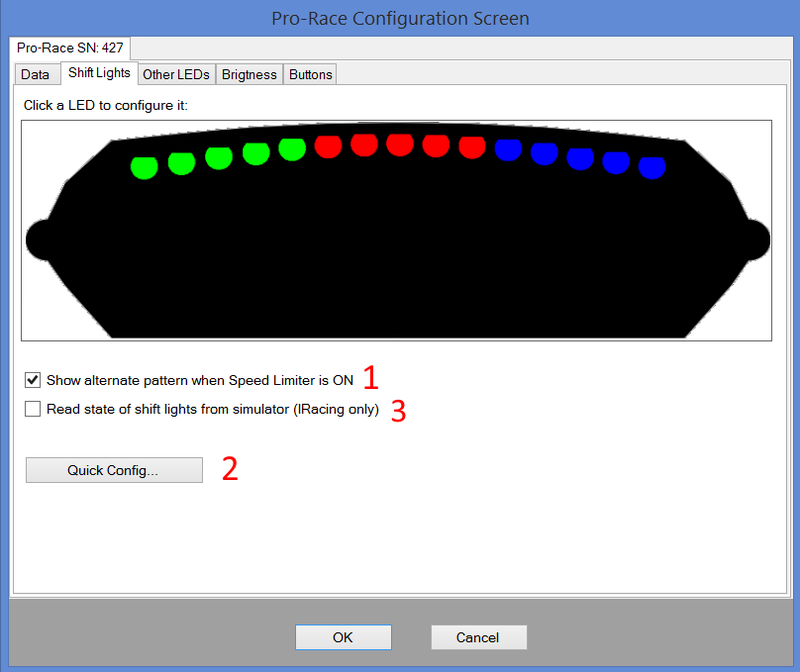 SimDash 19 supports the Pro-Race Micro shift array display. The Project Cars 2 plugin now works with the pCars 2 native telemetry, not the pCars 1 compatible one. Open the plugin's configuration screen to see how to configure the simulator. SimDash has been updated to work correctly with the 64-bits version of Raceroom Experience. Project Cars 2 is now supported. Codemaster F1 2017 is now supported. This version of SimDash supports NoLimits 2 Roller Coaster Simulator. Only speed data is available, to drive the Fan Controller. In the Pro-Race 2 configuration screen, in the Shift Lights section, there is a new checkbox available that , if enabled, will switch the shift lights on and off exactly when they are switched on and off in the simulator. No need to configure them. Only works with IRacing for the moment. New data is available with Race Room Experience: Fuel percentage, Brakes temperature, wheels pressure and wear. flags indicators, Pit Lane indicator, lap distance, gap from next player and from the leader. New data is available for Euro Truck Simulator and American Truck Simulator. This document contains the full list. Not every data item works every time. it looks like it is the game that doesn't send the correct data in some situations. To use the new data, you have to reconfigure the ETS and ATS plugins in SimDash. Open their configuration screens and follow the instructions. The new data won't be available in SimDash if you don't do this. Dirt 4 support has been added. More data will be available for this game very soon. The supported data is listed here. This version of SimDash supports the JC-LED controller. SimDash has been updated to work with the Nov. 2016 patch for RaceRoom Racing Experince. This version of SimDash works with the Fan Controller. There is small relay available for the Pro-Gauge controller, that allows gauges and dashboards back-lights to be switched ON and OFF when SimDash is started and stopped. With IRacing, the following data is available: delta time to best lap. delta time to session best lap, delta to lap lap, delta to optimal lap and delta to session optimal lap, traction control. Assetto Corsa: Is in Pit Lane flag, air temperature, flags, traction control. With SimDash v.11 or later and the Pro-Gauge mounting v.2 of the firmware, it is possible to connect this relay module to the Pro-Gauge, in order to switch the connected gauges ON and OFF, when SimDash is started and stopped. SimDash 1.3.2 added new functionalities to the SPI-D display and a firmware upgrade is required. As usual, if SimDash gives you green light when the SPI-D is connected, it means the display is already running the latest firmware available. There is an alternative firmware for the Pro Shift controller, which makes use of the eight buttons (four buttons with older versions of the Pro-Shift) that can be connected to the board. If you download and install the new firmware the Pro Shift, as well as the usual functions, will also be detected as a USB Game Controller with eight buttons, which can be configured in the simulator. The new firmware requires SimDash 1.3.5 or later. The original firmware will work with any version of SimDash. Pro Shift alternative firmware (newer Pro Shift, with 8 buttons and green pcb). Pro Shift alternative firmware (older Pro Shift, with 4 buttons and red pcb). Use the Bootloader to do the upgrade and follow these steps. The Bootloader application is used to update the Rev Burner, SPI-D, Pro Shift, SimScreen and all the other boards' firmware. Follow these steps to complete the operation. This small application is used to configure the joystick controllers.